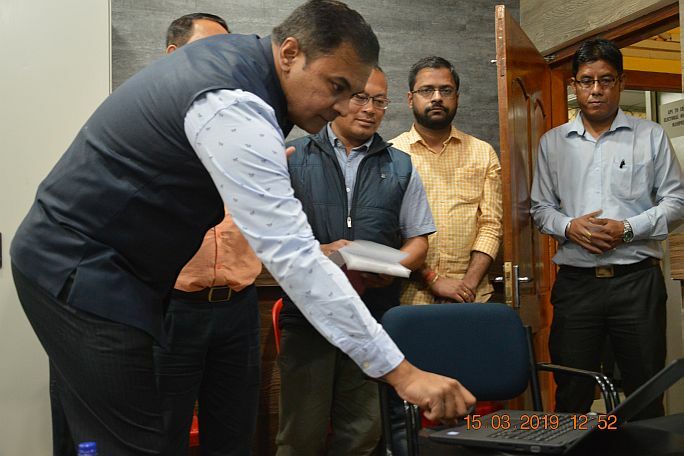 A Fire Safety Mock Drill was organized at NESAC on 08th February, 2019 with an aim of generating awareness among the staff of NESAC regarding Fire Safety, acquaintance with Fire Safety Systems available at NESAC and discussing general guidelines to be followed during a fire incident. 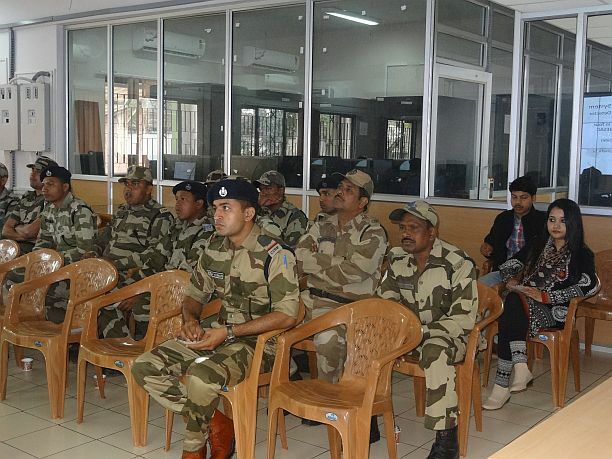 The Mock Drill was organized jointly by NESAC and Fire & Emergency Services Station, Umiam. 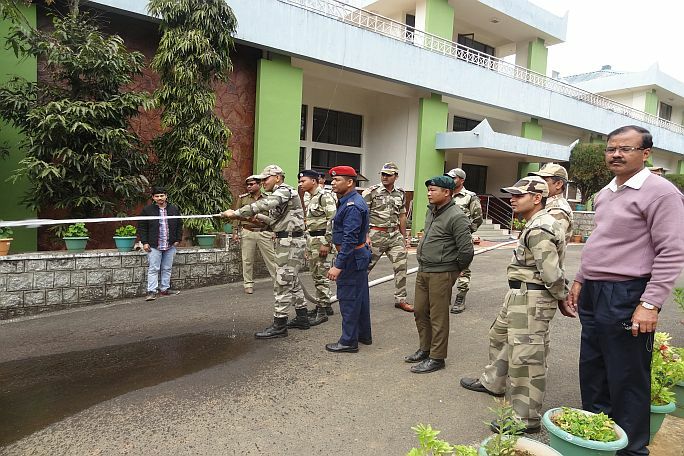 The Mock Drill was inaugurated by Director, NESAC Shri P L N Raju with a brief remark on the importance of awareness generation for Fire Safety. He also urged the staff of NESAC to be aware of all available Fire Safety Systems of NESAC and to participate in the Mock Drill enthusiastically to build capacity for Fire Fighting. After his introductory Speech, Shri Hafizur Rahaman, Senior Officer, Meghalaya Fire & Emergency Services Station, Umiam gave a brief lecture on Fire Safety. He stressed on safe use of fire and easily flammable objects for various activities and practicing safety measures in domestic as well as office environments. Shri Anjan Debnath, Safety Officer, NESAC gave a brief description of the different Fire Safety Equipments available at NESAC. 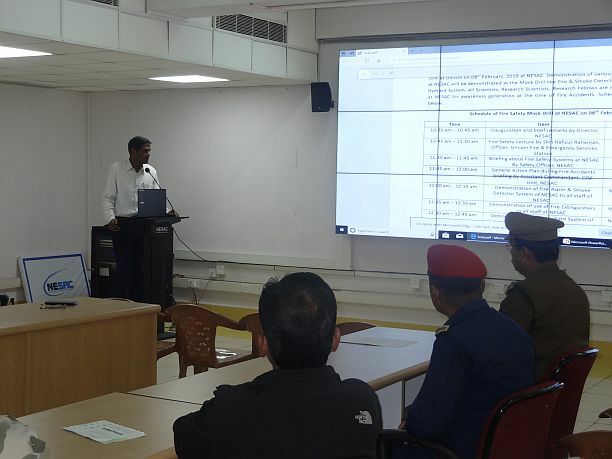 Shri Ramdas, Assistant Commandant, CISF Unit, NESAC presented a General Action Plan during Fire Incidents. He asked the staff not to panic and rather follow nearest exit points to gather at a common assembly points. He also identified the exits for different divisions. After the presentations, demonstrations of the different fire safety equipments available at NESAC were given by the Safety Officer to staff of NESAC. The Smoke Detector & Fire Alarm System, Portable Fire Extinguishers and Fire Hydrant were demonstrated.